FACTS is a system composed of static equipment used for the AC transmission of electrical energy. It enhances controllability and increase power transfer capability of the network and is generally a power electronics-based device. Today, however, the rapid worldwide expansion in large-scale wind and solar projects, coupled with the growth of heavy industry in Latin America, South Africa, and other regions, is providing new opportunities for flexible alternating current transmission systems (FACTS). FACTS is defined by the IEEE as "a power electronic based system and other static equipment that provide control of one or more AC transmission system parameters to enhance controllability and increase power transfer capability. FACTS technologies are the first line of defense against instability, as they supply reactive power to the grid. A number of technologies fall into this category, but as with any technology, it’s important to choose the right tool for the job. Each of the FACTS solutions has its own unique set of characteristics and capabilities. The FACTS concept uses new power-electronics switches and other devices to provide faster and finer controls of equipment to change the way the system power flows divide over the system under normal conditions or during contingencies. A FACTS device can be used to reduce the flow on the overloaded line and increase the utilization of the alternative paths excess capacity. This allows for increased transfer capability in existing transmission and distribution systems under normal conditions. Flexible AC Transmission Systems (FACTS) controllers have been used in power systems since the 1970s with the objective of improving system dynamic performance. Due to the environmental, right-of-way, and cost problems in both bundled and unbundled power systems, many transmission lines have been forced to operate at almost their full capacities worldwide. Over the past two decades, static reactive power compensators have evolved into a mature technology and become an integral part of modern electrical power systems. They are one of the key devices in flexible AC transmission systems (FACTS). Coordination of static compensators with other controllable FACTS devices promises not only tremendously enhanced power system controllability, but also the extension of power transfer capability of existing transmission corridors to near their thermal capacities, thus delaying or even curtailing the need to invest in new transmission facilities. Power transmitted between two nodes of the system depends on the voltages at both ends of the interconnection, the impedance of the line and the phase angle difference between both systems. Different FACTS devices can actively influence one or more of these parameters for power flow control and for improvement of voltage stability at the node of interconnection. The installation of FACTS solutions will continue, both to replace existing aging infrastructure and to support the trouble-free interconnection of wind and renewable generation. An April 2014 report from Navigant Research, worldwide revenue from FACTS will surpass $5 billion annually in 2022. Asynchronous Generator - A type of AC electrical generator that uses the principles of induction motors to produce power. Induction generators operate by mechanically turning their rotor in generator mode, giving negative slip. In most cases, a regular AC asynchronous motor is used as a generator, without any internal modifications. Induction generators are particularly suitable and usually used for wind generating stations as in this case speed is always a variable factor, and the generator is easy on the gearbox.Capacitor bank must supply reactive power to the motor when used in stand-alone mode. Reactive power supplied should be equal or greater than the reactive power that machine normally draws when operating as a motor. Terminal voltage will increase with capacitance, but is limited by iron saturation. Commutation - A major characteristic of the semiconductor switching devices employed in FACTS controllers. Commutation can either be forced as with GTOs, or natural as with SCRs, which turn off at zero current. FACTS – Flexibilty AC Transmission Systems. - Since the early eighties, advances in FACTS controllers such as RPC’s and SVC’s in power systems have led to their application to improve voltage profiles of power networks. FACTS controllers modify the series and parallel impedances of transmission lines. The way a FACTS controller is connected to the ac power system has a direct effect on the transfer of active and reactive power within the system. In the case of a no-loss line, voltage magnitude at receiving end is the same as voltage magnitude at sending end.. Transmission results in a phase lag δ that depends on line reactance X.
FSC - Fixed Series Capacitors - Switchable banks of capacitors inserted in series with a line to compensate for the inductive voltage drop, effectively increasing the line length. Frequency Scanning – A technique for analyzing SSR problems that is particularly effective in the study of induction generator effects. MSCDN - Mechanically Switched Capacitors with Damping Networks - Proven technology to provide a switchable source of reactive power to stabilize low frequency voltage variations. It consists in large shunt capacitor banks, arranged as a C-type harmonic filter, connected to the high voltage system to provide reactive compensation and harmonic control, but with reduced losses in the resistor at fundamental frequency by means of a resonance between the reactor and auxiliary capacitor. OPRF - Optimal Reactive Power Flow – A constrained nonlinear optimization mathematical model which describes the complexity of the voltage/Var control. the OPF can only reflect the steady state of power system. The high computation burden and a large number of controller movements make it less than an ideal tool for voltage/Var control. RPC – Reactive Power Controller – A frequently used device to improve voltage profiles of power networks. The RPC connects or disconnects capacitor stages automatically by detecting the phase divergence between the fundamentals of current and voltage. The measured divergence is compared with several segmental set phase divergence regions, capacitor contactors will be switched on or off according to it. SC - Series Compensation –The FACTS is connected in series with the power system. It works as a controllable voltage source. Series inductance exists in all AC transmission lines. On long lines, when a large current flows, this causes a large voltage drop. To compensate, series capacitors are connected, decreasing the effect of the inductance. It is a well established technology that primarily is used to reduce transfer reactances, most notably in bulk transmission corridors. The result is a significant increase in the transmission system transient and voltage stability. Series Compensation is self regulating in the sense that its reactive power output follows the variations in transmission line current, a fact that makes the series compensation concept straightforward and cost effective. Examples of FACTS for Series Compensation. TCSC - Thyristor Controlled Series Capacitor: similar to FSCs but provide dynamic power flow controllability and can mitigate the effects of sub-synchronous resonance. A series capacitor bank is shunted by a thyristor-controlled reactor. Thyristors are used to dynamically modulate the ohms provided by the inserted capacitor. This is primarily used to provide inter-area damping of prospective low frequency electromechanical oscillations, but it also makes the whole Series compensation scheme immune to Subsynchronous Resonance (SSR). 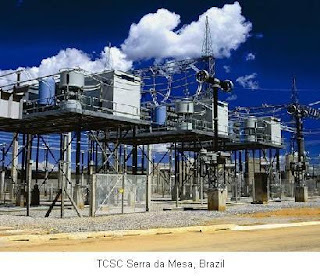 TCSCs are a derivation of the FACTS technology that uses power electronics to inject capacitance into the power system to improve power flow by controlling reactive power. There are roughly 100 TCSCs installed in the U.S., primarily in the west. Series Capacitors – Series connected controllers are usually employed in active power control and to improve the transient stability of power systems. Controlled by Thyristor add another controllability dimension, as thyristors are used to dynamically modulate the ohms provided by the inserted capacitor. This is primarily used to provide inter-area damping of prospective low frequency electromechanical oscillations, but it also makes the whole Series Compensation scheme immune to Subsynchronous Resonance (SSR). Shunt - A device allowing electrical current to pass around a point in a circuit. Shunt connected controllers govern reactive power and improve the dynamic stability. Shunt Capacitor Bank - Capacitors connected from the power system to an electrical ground. They are used to supply kilovars (reactive power) to the system where they are connected. Shunt Capacitive Compensation - This method is used improve the power factor. Whenever an inductive load is connected to the transmission line, power factor lags because of lagging load current. To compensate, a shunt capacitor is connected which draws current leading the source voltage. The net result is improvement in power factor. Shunt Inductive Compensation- This method is used either when charging the transmission line, or, when there is very low load at the receiving end. Due to very low, or no load -- very low current flows through the transmission line. Shunt capacitance in the transmission line causes voltage amplification (Ferranti Effect). The receiving end voltage may become double the sending end voltage (generally in case of very long transmission lines). To compensate, shunt inductors are connected across the transmission line. SSR - Subsynchronous Resonance – An electric power system condition where the electric network exchanges energy with a turbine generator at one or more nature frequencies of the combined system below the synchronous frequency of the system. It includes any system condition that provides the opportunity for an exchange of energy at a given subsynchronous frequency. STATCOM – Static Synchronous Compensator - A FACTS for shunt compensation. a regulating device used on alternating current electricity transmission networks. It is based on a power electronics voltage-source converter and can act as either a source or sink of reactive AC power to an electricity network. If connected to a source of power it can also provide active AC power. It has functional similarities to a synchronous condenser; however, instead of using a rotating electrical machine to provide VAr control it is accomplished using solid state power electronics. It is a voltage source converter which can provide a high speed change of reactive power and can be used alone or in combination with capacitor banks. STATCOMs are used in electric utility, wind farms and industrial applications. A STATCOM, can both generate and absorb reactive power, providing even greater control over grid stability than solutions which are only designed to inject reactive power onto the grid. This makes them especially useful for systems that are operating near their stability limits. STATCOMs are also fast, with reactions starting less than 10ms after an event and reaching full power within 20- 50ms, and since they are always in “hot stand-by” mode, power losses are measured at less than 1%. Finally, STATCOMs are a compact solution, making them ideal for situations where space is limited and footprint is an issue. SVC – Static VAr Compensator – An electrical device for providing fast-acting reactive power on high-voltage electricity transmission networks. SVCs are part of the Flexible AC transmission system device family, regulating voltage and stabilising the system. The term "static" refers to the fact that the SVC has no moving parts (other than circuit breakers and disconnects, which do not move under normal SVC operation). Prior to the invention of the SVC, power factor compensation was the preserve of large rotating machines such as synchronous condensers. SVCs provide fastacting (20-30 ms) reactive power for high-voltage transmission networks and can be used to dampen power oscillations and stabilize power at the receiving end of long lines. In addition, SVCs can be used to raise the dynamic stability limit closer to the thermal limit, increasing the capacity of the lines. One example of static VAR compensators in use can be found in Tennessee. Tennessee Valley Authority (TVA) decided to phase out the coal units at one of its primary power plants, some of which were built back in 1949. While coal is not the only fuel consumed at the plant, the conversion could have caused quality issues because the big, coal-powered generators provided the dynamic stability needed for the TVA’s increasingly diverse mix of power sources. TCR - Thyristor Controlled Reactor: reactor is connected in series with a bidirectional thyristor valve. The thyristor valve is phase-controlled. Equivalent reactance is varied continuously. 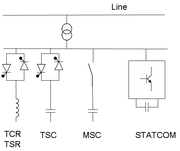 TSR - Thyristor Switched Reactor: Same as TCR but thyristor is either in zero- or full- conduction. Equivalent reactance is varied in stepwise manner. TSC - Thyristor Switched Capacitor: capacitor is connected in series with a bidirectional thyristor valve. Thyristor is either in zero- or full- conduction. Equivalent reactance is varied in stepwise manner. MSC -Mechanically Switched Capacitor: capacitor is switched by circuit-breaker. It aims at compensating steady state reactive power. It is switched only a few times a day. Synchronous Condenser - . Synchronous condensers improve grid stability and reliability by providing reactive power compensation and additional short-circuit power capacity. They also provide spinning power to the grid, making them a useful solution for providing inertia as more coal plants are being shut down. Thyristor - A solid-state semiconductor device that acts as a bi-stable switch, conducting when their gate receives a current pulse, and continue to conduct for as long as they are forward biased (that is, as long as the voltage across the device has not reversed. Thyristors are mainly used where high currents and voltages are involved, and are often used to control alternating currents, where the change of polarity of the current causes the device to automatically switch off; referred to as Zero Cross operation. Transformer Tap - A connection point along a transformer winding that allows a certain number of turns to be selected. By this means, a transformer with a variable turns ratio is produced, enabling voltage regulation of the output. The tap selection is made via a tap changer mechanism. UPFC - Unified Power Flow Controller - an electrical device for providing fast-acting reactive power compensation on high-voltage electricity transmission networks. The UPFC is a versatile controller which can be used to control active and reactive power flows in a transmission line. The concept of UPFC makes it possible to handle practically all power flow control and transmission line compensation problems, using solid state controllers, which provide functional flexibility, generally not attainable by conventional thyristor controlled systems. The UPFC is a combination of a STATCOM and a SSSC coupled via a common DC voltage link. It is capable of controlling simultaneously or selectively, all the parameters affecting the power flow in a transmission line. The parameters usually are voltage, impedance and phase angle. Integrating Wind Power into the Grid - The dominating kind of wind power generation is asynchronous, this since it is robust and cost effective. Induction generators, however, do not contribute to regulation of grid voltage, and they are substantial absorbers of reactive power. Ideally, they need to be connected to stiff grids in order not to impact power quality. In reality, wind power is usually connected far out in the grid, on sub-transmission or distribution levels, where the grid was not originally designed to transfer power from the system extremities back into the grid. The reactive power balance of asynchronous generators can be improved to a certain extent by use of the doubly-fed rotor concept. To keep this technology within reasonable cost margins, however, rotor converter ratings must be kept limited to steady-state requirements only. During transient occurrences in the grid, the performance of doubly-fed induction generators (DFIG) may well prove inadequate to safeguard primarily voltage stability of the grid. Here, dynamic reactive power compensation plays an important role in supporting DFIG. This is where FACTS is coming in. Hierarchical Voltage Control - Italy is one of the pioneers who have implemented automatic voltage regulation of the synchronous generators. Its approach is based on a hierarchical control structure, which involves spatial and temporal decomposition of the whole control problem into several sub-problems. This approach have implemented in Romania, Italy, France, Spain, Belgium and some other countries. It is also the most mature automatic voltage/Var control system. It improves the voltage security by quickly bringing back the system voltages to normal values in a closed control loop after any contingency happened and continuously manage the reactive power generation based on the solution of OPF to keep a large enough margin for preventing voltage collapse. The transmission losses are also reduced by keeping the pilot nodes’ voltages at their optimal values. Fuzzy Logic - Fuzzy logic can deal with the uncertainties of real power system through fuzzy set theory. FACTS for HVDC – The backbone of HVDC transmission is a FACTS device which is the converter station that converts AC to DC for transmission and then converts DC back to AC at the other end of the line. Power electronics do the heavy lifting in these applications. In the 400- to 1000-MW range, second generation IGBT power-electronic devices are used, while in the 1000-MW and above range, older technologies are used (namely, thyristors). As load growth increases and the use of renewable power generation located far from the load pocket becomes the norm, there will be increased demand for DC technology. DC technology may be the only effective means of increasing power flow on an existing corridor that was originally built for AC transmission. FACTS for Controlling Reactive Power – TCSCs are a derivation of the FACTS technology that uses power electronics to inject capacitance into the power system to improve power flow by controlling reactive power. There are roughly 100 TCSCs installed in the U.S., primarily in the west. Eastern utilities have been reluctant to take advantage of this technology due to concerns about sub-synchronous resonance. Further development of thyristor control can dampen those oscillations. FACTS for Electronic Transformers – Power-electronic transformers will eventually become part of the transmission system. Existing mechanical switching is accomplished within about 6 AC cycles. This is rapid enough for most applications. However, there is a need for a power-electronic device that could reduce short-circuit currents and then act as power-electronic circuit breaker at the same time. The potential maximum for short-circuit currents is growing so as to exceed the maximum capacity of today’s breaker fleet. A distribution device to limit short-circuit currents using power electronics has been demonstrated. Further development could allow this device to scale up to high voltage and, coincidentally, act as a fast-switching power-electronic breaker. This device would have the added benefit of eliminating the use of SF6. Considerable effort has been expended in the development of distribution transformers based on power electronics. Using power electronics in transformers can eliminate the majority of the inductance and, along with it, all of the oil used as coolant, resulting in a substantial reduction in the losses. In addition, it offers a great deal more flexibility in voltage control. The potential to scale up the distribution version of this transformer is promising. Further advancement in power electronics will be needed to realize for this transmission application. Enhanced Static Performance - FACTS controllers provide increased loading, congestion management, reduced system loss, economic operation. Reduced transmission congestion costs from increased transmission transfer capability without building additional transmission capacity. Reliability - Provide spinning reserve support Improves system stability. Cost Savings - Increases the amount of power that can be imported over existing transmission lines. Minimize cost of energy Minimize kWh consumption at voltages beyond given voltage quality limit; ensure standard voltages at customer terminals Conserve energy via voltage reduction. Reduces the need for construction of new transmission lines, capacitors, reactors, etc which mitigate environmental and regulatory concerns, and improves aesthetics by reducing the need for construction of new facilities. Dyanmic Reactive Power Compensation - Controls real and reactive power flow. Steady-State and Transient Stability Enhancement - Mitigates potential Sub-Synchronous Resonance problems. Cost - FACTS is a concept invented by EPRI in the 1980s, for which EPRI developed several patents licensed to Siemens. It involves the injection of a variable-voltage source, which adjusts the power flow across a transmission line, resulting in variable voltage, impedance, and phase angle. Six successful major FACTS installations were demonstrated, each with several key features. For example, one installation at the New York Power Authority’s Marcy Substation resulted in the ability to increase power-transfer capacity into New York City by 200 MW, resulting in substantial savings. the cost and performance of the power-electronic devices themselves. As of now, the first two of these issues have been resolved, and with the successful demonstration of advanced power electronics, there is relative certainty that the industry is poised for a rebirth of FACTS. This is especially important with the introduction of increasing amounts of variable generation – like wind and solar – located far from load pockets. Overvoltage - Electrical loads both generate and absorb reactive power. Since the transmitted load varies considerably from one hour to another, the reactive power balance in a grid varies as well. The result can be unacceptable voltage amplitude variations, a voltage depression, or even a voltage collapse. Undervoltage - Series inductance occurs in long transmission lines, and when a large current flow causes a large voltage drop. To compensate, series capacitors are connected. Sub-Synchronous Resonance between a series-capacitor-compensated electric system and the mechanical spring-mass system of a turbine-generator at sub-synchronous frequencies. Beginning about 1950, series capacitors were installed in long alternating-current transmission lines [250 km (150 mi) or more] to cancel part of the inherent inductive reactance of the line. Until 1971, up to 70% of the 60-Hz inductive reactance was canceled by series capacitors in some long lines with little concern for side effects. (If 70% of a line's inductive reactance is canceled, the line is said to have 70% series compensation.) In 1970, and again in 1971, a turbine-generator at the Mohave Power Plant in southern Nevada experienced shaft damage that required several months of repairs on each occasion, following switching events that placed the turbine-generator radial on a series-compensated transmission line. The shaft damage was due to torsional oscillations between the two ends of the generator-exciter shaft. Shortly after the second event, it was determined that the torsional oscillations were caused by torsional interaction, which is a type of subsynchronous resonance. It has been clearly established that subsynchronous resonance can be controlled with the use of countermeasures, thus making it possible to benefit from the distinct advantages of series capacitors Three types of tripping countermeasures are applied: torsional motion relay, armature current relay, and the generator tripping logic scheme. The second method of protection does not involve turbine-generator tripping, but eliminates or limits harmful torsional oscillations. Both RPC and SVS incur large financial investment. Since they work only in a local area, the reactive power sources of a network must be coordinated with the aim to achieve network voltage stability. New technologies such as dynamically insertable reactants are being created. Georgia Tech has developed a clever device that wraps around a transmission line conductor and can be used to dynamically increase the reactants of the line, and it’s a way to relieve congestion on transmission lines that are subject to parallel flow issues. Power Electronic Devices for Mitigating Geomagnetically-Induced Currents– Geomagnetically-induced currents can cause serious problems to high-voltage equipment and promote blackouts. The future application of power electronics to be applied to the grounded neutral on substation transformers could neutralize these currents. Further development is needed to realize this technology in the 2020 to 2030 time frame. AMSC's D-VAR (Dynamic VAR) is the most widely deployed STATCOMS solution in the world. These STATCOM systems utilize proprietary and advanced control and monitoring technology that detects and instantaneously compensates for voltage disturbances by injecting leading or lagging reactive power. At the heart of each D-VAR STATCOM system are AMSC's PowerModule™ advanced power electronic converters. PowerModule inverters are an intelligent, fully integrated four-quadrant power converter with high power density. D-VAR STATCOMS can respond to both rapid and slow voltage events, providing the same level of security, reliability and enhancement to the grid as an SVC. AMSC is North America's only static VAR compensator (SVC) manufacturer. The AMSC SVC is a solid-state FACTS device that provides dynamic reactive power compensation based on proven thyristor technology. Installing a static VAR compensator at appropriate locations in the transmission network can help stabilize weak systems, minimize line losses, increase power transfer capability and can provide greater dynamic voltage control. Static VAR compensators can respond to the fastest of voltage transients that appear on power systems and can reduce the risk of detrimental voltage collapse. The vernier control provided by SVCs also allows for steady-state voltage regulation, maintaining a smooth voltage profile. Varentec San Jose, CA - Provides products and solutions that achieve smarter power delivery for its customers. Funded by Bill Gates and Khosla Ventures, Varentec is also the recipient of support from the Department of Energy. Thanks for the practical information. Good summary. Also i recommend "Facts Controllers in Power Transmission & Distribution" by K.R.Padiyar.